as a chandelier-like piece with television screens at each of its four corners; and seven or eight windows, all of which will contain light boxes feautering his paintings. reemergence is an organic progression. The cavernous Limelight as the setting for the artists eerie works is a flawless union. 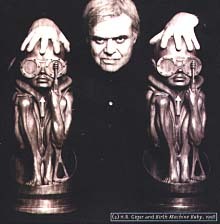 And after all, New York is the logical place for Gigers work to be displayed in the U.S., since it is the one and only city in the country that he finds inspiring. During his trip to New York, in the autumn of 1977, Giger was amazed by his surroundings. In retospect, he wrote "There is no crazier place imaginable. I was half in trance, and totally overhelmed." This trip ignited the artists passion to create his New York City Series paintings.One of the most important Surrealist artists of the late century, Giger is a visionary, often drawing inspiration from the terror of the subconscious. "I paint what frightens me," he explains. 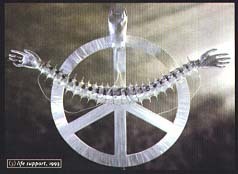 Looking into the future with a critical eye on the choices man makes in an existential search for scientific, intellectual, and spiritual answers to life, Giger foresees the danger of our next evolutionary step. 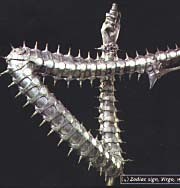 It is important to Giger that his work is accessible to the public. And now, the artist reappears at the Limelight, years after his exhibit. 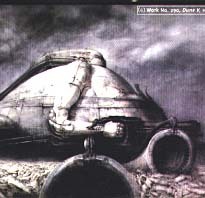 The Dune you will never see was exhibited there in 1984. Were glad to have you back! due on newsstands January 1999.